Be the first to share your favorite memory, photo or story of Rose Anna. This memorial page is dedicated for family, friends and future generations to celebrate the life of their loved one. 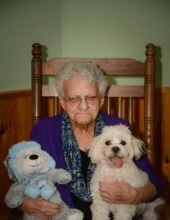 Saint Albans – Rose Anna Marguerite Wood died peacefully at her home on Wednesday, February 6, 2019, with her family and friends at her side. She was born on March 16, 1932, in Manchester, New Hampshire to William and Rose Deselle. Rose is survived by her partner, Wesley Wood and their three children, six grandchildren, sixteen great-grandchildren, three step-granddaughters and four step great-grandchildren: Diane Nichols and her husband, Randall and their children, Jeremy, Tonyel and Joshua and their children, Torie, Haley, Dakota (Alexis) Austin (Kierstynn), Tyler, Kaylee and Aiden; Shirley Reisher and her partner, Timothy Garman, and her daughter, Stephanie and her husband, Curtis, and their children, Canyon, Coral and Chason; John Wood and his wife, Lynn, and their children, Brian Wood and his wife, Maritza, and their children, Andrielle and Bryce; Kimberly Dibernardo and her husband, Chris, and their children, Delaney, Kaiden, Mikaela and Liam. She is also survived by her step-granddaughters, Jennifer Danyow and her children, Donovan, Timothy and Xander; Jessica Pelchat and her husband, Mike, and their son, Dominic and Christine Yeingst, as well as her sister, Louise Werner and many nieces and nephews. In addition to her parents, Rose was pre-deceased by a brother and nephew. Rose was an amazing person, she lived life to the end. She loved her family, especially all her grandchildren, who she loved very much. She enjoyed camping, collecting all types of angels, attending CarePartners Adult Day Center and the beach. She told me when I had a daughter that the two of them would be best friends and to the end the two of them had a special connection that I never would have imagined. Even though Tonyel wasn’t with her at her bedside, she made sure she called her every day to check on her. Diane would like to give a special thanks to CarePartners and Bayada Hospice, and Mike Ellis from Bayada for all the help and support they gave my family with mom. Rose’s family will receive family and friends on Saturday, February 9, 2019, from 2:00 to 3:00 PM at the Heald Funeral Home, 87 South Main Street, St. Albans. A funeral service will follow at 3:00 PM led by Mike Ellis, spiritual counselor for Bayada Hospice. Her family asks that memorials in her name be made to CarePartners Adult Day Center, 34 Franklin Park West, St. Albans, Vermont 05478 or Bayada Foundation Hospice Health Care, 2517 Shelburne Road – Suite 1, Shelburne, Vermont 05482. To send Rose’s family a message of condolence or share a memory, kindly go to her on-line guest book at www.healdfuneralhome.com. To plant a tree in memory of Rose Anna Marguerite Wood, please visit our Tribute Store. "Email Address" would like to share the life celebration of Rose Anna Marguerite Wood. Click on the "link" to go to share a favorite memory or leave a condolence message for the family.